Discern The Priesthood Why Be a Priest? The priesthood is a calling. Christ asks of some men the sacrifice of their lives in following him as his more intimate companions. From all eternity, certain men are called to the priesthood. It is a call inscribed in their nature and because of this, is a call that will bring them fulfillment. A priest acts In Persona Christi. A priest wields a Sacred Power. When a priest makes the sacraments present, he wields a sacred power from God, in Latin, sacra potestas. A priest’s soul changes forever. 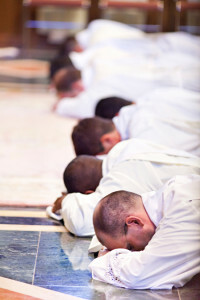 At ordination, a man’s soul undergoes an ontological change—a change of being—which indelibly marks his soul forever. Once a priest, always a priest. Could God be calling you to be a priest? God made you for a unique purpose. Even before you were born, he knew your vocation, your mission in life. And if you are a faithful Catholic man, God may be calling you for a higher purpose—to become a Catholic priest. Priests have a critical mission: to bring people to Jesus and Jesus to people. They are spiritual fathers to thousands of Catholics. They preach the Gospel and offer the sacrifice of the Mass. In short, priests are living witnesses of Christ in the world—men of strong character who stand out in our secular culture. A good priest is a spiritual hero, a man who sacrifices himself for the people of God. Is Jesus calling you to be his priest? Read more: What do priests do?